As NASA’s New Horizons mission continues exploring the unknown, the mission team has selected a highly appropriate name for its next flyby target in the outer reaches of the solar system. With substantial public input, the team has chosen “Ultima Thule” (pronounced ultima thoo-lee”) for the Kuiper Belt object the New Horizons spacecraft will explore on Jan. 1, 2019. Officially known as 2014 MU69, the object, which orbits a billion miles beyond Pluto, will be the most primitive world ever observed by spacecraft—in the farthest planetary encounter in history. Thule was a mythical, far-northern island in medieval literature and cartography. Ultima Thule means “beyond Thule”—beyond the borders of the known world—symbolizing the exploration of the distant Kuiper Belt and Kuiper Belt objects that New Horizons is performing, something never before done. The popular campaign wrapped up on Dec. 6, after a five-day extension to accommodate more voting. The campaign involved 115,000 participants from around the world, who nominated some 34,000 names. Of those, 37 names reached the ballot for voting and were evaluated for popularity—this included eight names suggested by the New Horizons team and 29 nominated by the public. 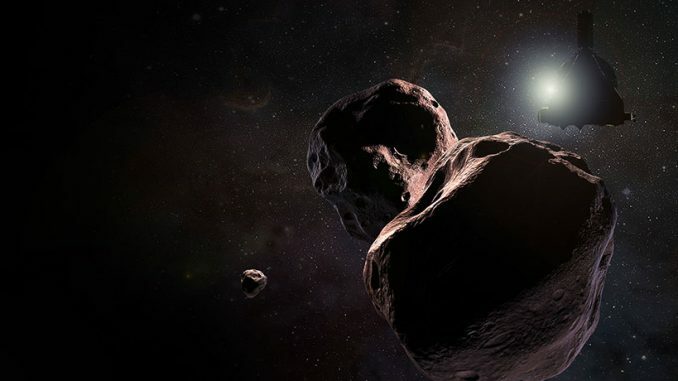 The name was suggested to think of MU69 as a distant follow up to Pluto, which New Horizons historically and famously encountered in July 2015. Other names considered included Abeona, Pharos, Pangu, Rubicon, Olympus, Pinnacle and Tiramisu (the final tallies are posted at http://frontierworlds.seti.org).